Now in its Third Edition, An Introduction to Medical Statistics continues to be and invaluable textbook for medical students, doctors, medical researchers, nurses, members of professionals allied to medicine as well as those concerned with medical data. The material covered includes all the statistical work that would be required for a course in medicine and for the examinations of most of the Royal Colleges. It includes the design of clinical trials and epidemiological studies, data collection, summarizing and presenting data, probability, standard error, confidence intervals and significance tests, techniques of data analysis including multifactorial methods and the choice of statistical method, problems of medical measurement and diagnosis, vital statistics, and calculation of sample size. The new edition describes the design and analysis of medical research studies in a clear and user friendly manner. The third edition includes new topics such as consent in clinical trials, design and analysis of cluster-randomized trials, ecological studies, conditional probability, repeated testing, random effects models, intraclass correlation and conditional odds ratios. Material which is encountered only at the postgraduate level has been indicated clearly in the text to facilitate ease or use. The book is firmly grounded in medical data, particularly in medical research, and includes real illustrative examples. There are 100 multiple choice questions and 17 long questions involving calculations to which fully explained solutions are provided. 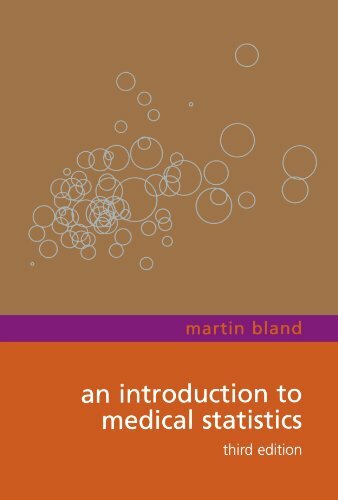 A new companion volume, Statisitical questions in evidence based medicine (Bland & Peacock, 2000) refers directly to this new edition. This new book of questions and answers includes no calculations and is complementary to the exercises given here.